Topic: Does anyone have a Yoshimura ported head? I’m looking to find someone with a head ported by the Yoshimura company in the 70-80s. Cb750 head preferable, but others OK too. I’m looking to see the style of porting they incorporated, specifically “valve guide out” porting or “valve guide in” porting. Re: Does anyone have a Yoshimura ported head? I have a Yoshimura ported head which was done back on the day. It is fitted to my Yoshimura engine but a can try to get pics from outside the ports if that is any use to you? Yes, that would be fantastic. A few good pictures up the intake ports with a smart phone with the flash on would be great. Exhaust port a secondary interest. That would tell me a lot. george, pics are better than nothing but honestly, seek someone who can make silicon castings... see attached pdf. I totally agree, I am first trying to identify the porting styles in general and more specifically whether the particular cb750 head I have was plausibly ported by Yoshimura as was suggested possible by the seller(as 3rd owner of engine, 1st owner reportedly spent a pile with Yoshimura in the mid 70s, it had a hand bent Yoshimura stove pipe race exhaust and a set of Smoothbores 29s on it at the time that Ted (Ricky Racer) has kept. 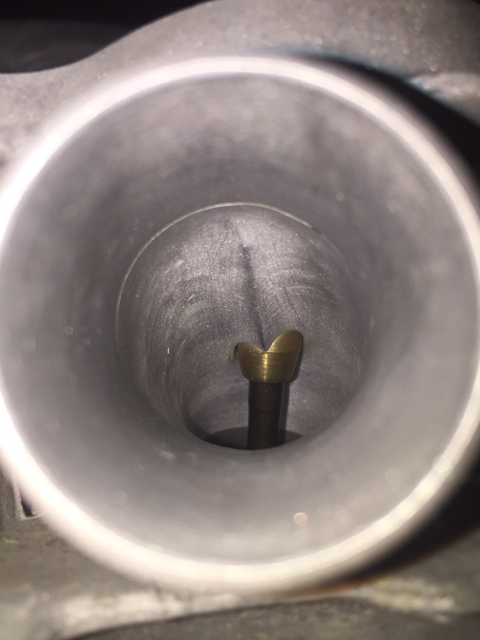 For example, this is the intake port of a cb550 head that is also attributed to Yoshimura. Notice both are “valve guide in” style. want me too. I haven't had the head off so don't know if there are any marks or stampings. Medyo, is that one yours? Is it stamped Yoshimura anywhere? It sure looks like a comparable porting style to other assumed Yoshimura porting examples.